Ceratostigma (Ceratostigma plumbaginoides): growing, planting, caring. 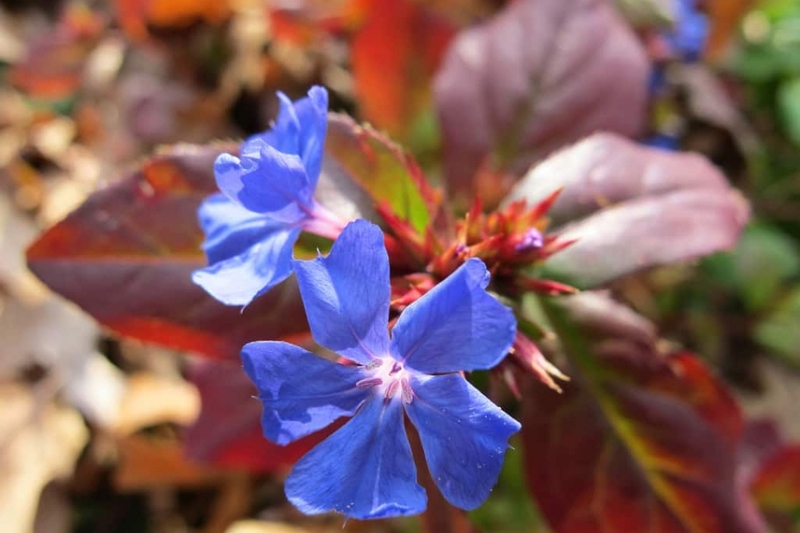 Ceratostigma, or leadwort, is a genus of eight species of flowering plants in the family Plumbaginaceae, native to warm temperate to tropical regions of Africa and Asia. Common names are shared with the genus Plumbago. The most widely cultivated species is Ceratostigma plumbaginoides, Lady’s lace, which is also the most hardy, down to -20 ° C. Its intense blue bloom, composed of many small cross-shaped flowers, is usually appreciated. These flowers that appear in summer easily attract bees and butterflies. This plant is perennial and produces many rhizomes that allow it to grow in width rather quickly. It forms a ground cover not exceeding 25 centimeters in height. Growing Ceratostigma is very easy, even in a pot. Plant your plumbago in the sun or possibly in partial shade from February to April and from September to November. Plumbagos prefer fresh, fertile, well-drained soil to provide abundant flowering. Remember: they are ground cover, so plan a little space around for their development. Tamp the soil well to remove air around the roots, then water thoroughly. During the first month, water once or twice a week. In pots, water from April to October twice a week. Very easy: between April and June, slice some of the rhizomes with a spade, and replant it in a new location. If your soil is poor and stony, a supply of organic matter - like mulching - on the surface in November can help greatly in the first years. Plumbagos fear only powdery mildew, which benefits from warm and humid periods. Be careful never to wet the foliage while watering.